Every once in a while I take my trailer up to the mushroom farm. They sell bags of spent mushroom compost for around $3/bag. I usually fit about 16 bags of bulk mushroom compost in the trailer, and it costs a bit under $50. That’s a relatively cheap way to get a large quantity of decent compost, but you can squeeze a lot more value out of it than that! I bring the bags of spent mushroom compost home and put them under my house where it’s dark and cool. I use a mister to spray the growing mushrooms with water every morning and night, to make sure the layer of peat on top of the compost stays moist. 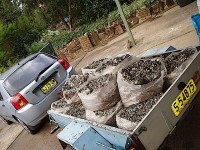 The mushroom compost is not really ‘spent’, it’s just no longer producing commercially-viable quantities of mushrooms. Mushrooms will soon start growing though, and I can continually pick them for about 3 to 6 weeks. On a good day, I can get a kilo or more of mushrooms, but it typically averages about 2-3 kg a week. Eventually, the growing mushrooms get overrun by various other types of fungus and it all turns to mush. By the time this happens, I’ve harvested 10 kg or more of mushrooms. The thing that amazed me about growing your own mushrooms is how different they are to store-bought. Isn’t that the same for everything? 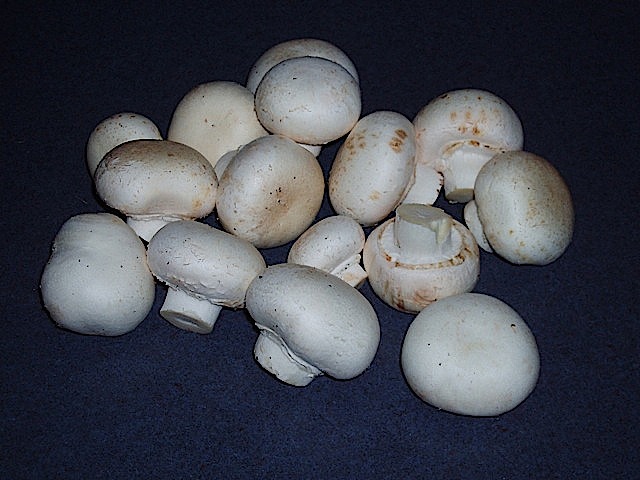 Fresh-picked mushrooms are sweet and have a really creamy flesh. The difference is incredible. So what do you do with that many mushrooms? Well, you soon get sick of mushrooms on toast for breakfast. They’re nice on the BBQ, or you can stuff them and bake them. Or add them to salad. You can still only take so much mushroom, though. The best way I’ve found to preserve excess mushrooms is to chop them and saute in olive oil and butter, then scoop into muffin trays for freezing. Once frozen solid, you can tip them out of the muffin trays and put them in plastic bags back in the freezer. Whenever you want mushrooms for a soup or casserole, just take a portion out and drop it in. Or you can defrost them for pizza toppings, as a garnish on steaks, or to simply serve on toast. Oh, and once the harvest ends you still have the bags of (truly!) spent mushroom compost for the garden. It really holds water well and supplies micronutrients, although I’ve found it best to blend it into other stuff in the compost heap for a few weeks before using it. The compost is sterilised before being used to grow mushrooms, so you want to make sure it gets repopulated with microorganisms to help make your soil really healthy. Wow, fantastic to see you are enjoying so many mushies! We’ve been talking about picking up some mushroom compost and growing mushies from it for a while but haven’t got around to it yet. Could you let us know the address of the place you got the mushroom compost from and the opening times or contact number? Good idea about mixing the mushie compost in with your general compost before use. We haven’t found it the best to add straight to the garden either. We once put a fair bit of straight mushie compost in our worm farm and killed all the worms! Ooops! Cheers and enjoy your mushies! The place I got them from was Fort Drummond Mushrooms, up at Mount St Thomas. They’re in an old military bunker under the hill where WIN TV is. Wow. I had no idea that would work! We have a place that sells mushroom compost near us, but they call it “spent mushroom substrate,” so I always had this idea that it was somewhat depleted of nutrients. But clearly you’ve got a good thing going there. I’m going to have to check into this possibility in our area. Thanks for this tip! The place I get the mushroom compost from sells it still in the growing bags (you can see them in the photos). This is how you want to buy it. If it’s been tipped out into a big pile or rebagged, it probably won’t grow more mushrooms. They call it “spent”, but in reality it will still produce another flush or two of mushrooms. It’s just that it’s past its peak productive output, so it’s not really economic for the growers to keep it around. They’d rather get it out and put in some fresh stuff that will produce much more mushrooms. I’m getting less than a kilo of mushrooms per bag over about a month – not a very viable commercial activity! Anyway, if you can get some cheap it’s worth it to experiment. At worst, it can just go into the compost. Just ask the seller if they have done anything to it first. Some spray with fungicide to kill the mushrooms off (so people like me can’t keep growing them, I guess!) – you definitely don’t want to put that in your garden or compost. It’ll kill off all your beneficial garden fungi. Fantastic, I don’t like mushrooms but i would like to try it to see how diffrent they taste from store bought ones. Can you email me with the address where you get them from. You and megan are doing so well in your sustainabliltiy challenge. Cheers donna. Hi Donna! There’s a link a couple of comments above that will take you to a map, which also contains their phone number. If you go to pick some up, take a very large tub (like washing basket size), or better yet a trailer or ute. The bags have quite a bit of moisture in them, and will leak water everywhere. You don’t want them in your car! They’re quite heavy too, so take a passenger :-). I just realised that map isn’t quite accurate. 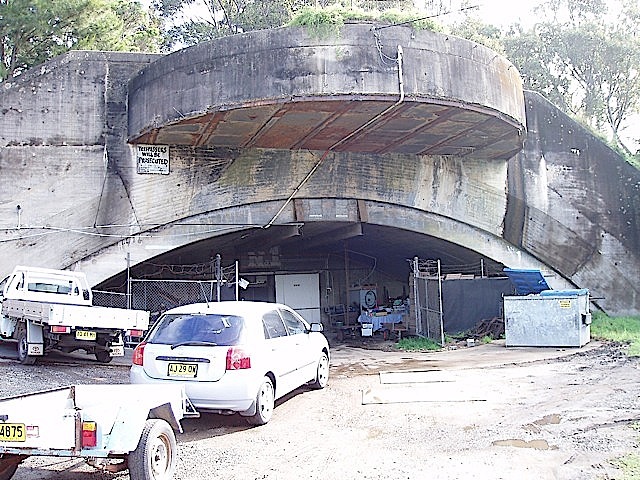 The mushroom farm is a little bit north and east of the marker on the map – on Television Ave. It’s very easy to find if you just head east from the Figtree shopping center (but stay on The Avenue, don’t turn south towards the steelworks). Hi Tricia! I’ve been enjoying your blog recently. Yeah, those Bunnings kits are expensive. A few people I know have bought them and not gotten a single mushroom from them! They did everything right – I think they’d just been sitting on the shelf too long. They took them back and demanded a refund. I’m not sure about total darkness. They do grow on the forest floor in nature, but then the commercial growers have them underground in complete darkness so maybe they do better without light. I do know that they need fairly cool temperature – about 18C is ideal. Look forward to giving it a go some time! Good luck, Tricia. Blog about how you go! What a great idea !! I just purchased some compost from a local farm so I will keep a few bags in our garage, water and see what happens. Please come back and let me know how it goes, Lisa. Hopefully you’ll get a nice crop! @Alan: Have a search around the web. There seem to be lots of sites selling mushroom kits etc for the US. My only experience is with buying “spent” mushroom compost and growing more mushrooms until it really is totally spent. Hi Darren, very interesting. I would never have thought the “spent” compost had enough life and nutrients left. What is the smell like? 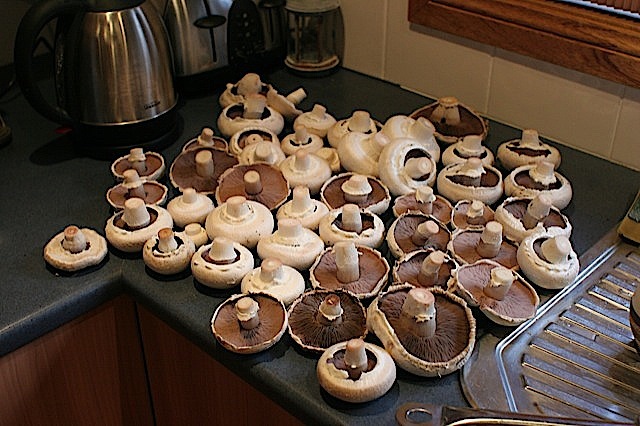 My personal method is to clone mushrooms from the supermarket. I have cloned the oyster, enoki, and shiitake. My current project involves the cloning of the king oyster and beech mushrooms. I have sucessfully colonized cardboard with the king oyster and transferred pieces to 1/2 pint jars of substrate. On the weekend I tossed fresh beech mushrooms into bags of coffee grounds I received free from Starbucks. It turns out that Starbuck’s corporate policy is to give spent coffee grounds away for free as compost. I posted the address of my blog in the website field. @Michael: They call it “spent” mushroom compost, but in reality it’s only spent from a commercial point of view. The production level has dropped off, so they get rid of it and bring in bags of new compost with higher production. I get less than a kilo of mushrooms from each bag, so it wouldn’t be worth their time to keep them around. Your blog and your mushroom projects look really interesting. If that bag of coffee grounds fruits, I’ll be copying that trick for sure! Mushroom Compost is a great idea! We get people in every week who have only recently discovered the wonders of (possibly) the best organic compost around! But what of the chemicals that are added to control contamination, fungus gnats, and the like? @Michael: There may be chemicals added to the mushroom compost, but they were growing food in them so it wouldn’t be anything harmful to humans (well, not ‘officially’ harmful!). If you had concerns about it (e.g. if you want to eat organic, or planned to use the compost on an organic garden) then all you have to do is ask the mushroom grower. I recently heard of a neighbor who was canning wild mushrooms. You should explore that idea. @lovejahlive: I’ve never really done much canning or preserving, although it’s something I’d like to get into more. I’d also like to try dehydrating them, which is supposed to work well. Very interesting. I googled and saw mushroom companies selling their mushroom compost. I had a commercial mushroom kit, and got about 20 brown mushrooms. I was wondering if I left a mushroom to grow big, would it spore and produce new “seedlings”? @Ann Chin: Yes, if the mushroom grows big it will produce spores. However, they will not produce new “seedlings” if they just fall back onto the same growing medium, as it will already be full of mycelium. You can collect them and innoculate a new batch of growing medium, though. You can also propagate via tissue culture. A web search on “growing mushrooms” will give you lots of methods – just ignore the web sites about growing magic mushrooms! @Julian: Sorry, I don’t live in that area so don’t personally know of local suppliers. Try looking up “mushroom farms” in the local Yellow Pages – they have 6 listed around Caloundra. I’m sure if you ring around you’ll find someone. The mushroom compost I got from him is very good quality, better than stuff I’ve got from other suppliers over the years. I put 20 bags into the vegie gardens (past experience has been that mushrooms will even come up in the vegie gardens from the compost), a few bags into the compost bin and I have 3 bags that I’m keeping purely for the mushrooms that’ll grow in them. @Mieux: Thanks for supplying that info. I would definitely recommend either having it delivered or using a trailer. Compost juices (and manure juices, too, for that matter!) do not go well inside the vehicle! 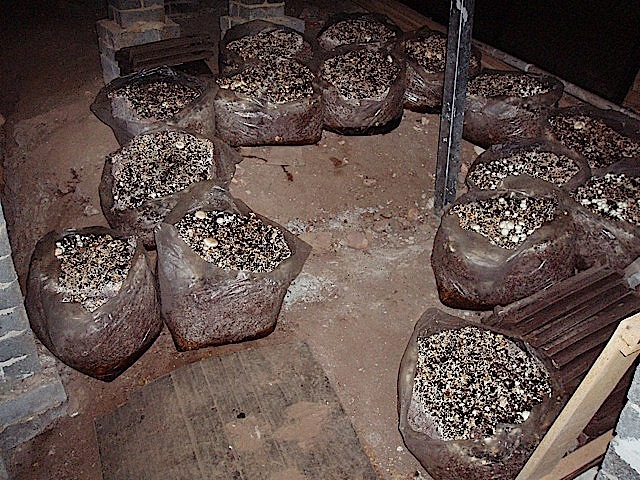 Hi I need help locating a mushroom farm company in the western area of NSW. Too far to travel otherwise. i.e. north of Dubbo. Any suggestions? @nez: I’ve no idea, I’ve only been to western NSW once a long time ago. Have you tried looking it up in the Yellow Pages? Perhaps someone will read this and give you more info. Hi, I’ve really enjoyed all this great info. Does anyone know where I can purchase a mushroom kit in the Whitsundays in Queensland? I purchased a couple of bags of mushroom compost recently. I put them under the house, in the dark, but didn’t water them as they seemed very wet. Unfortunately they dried out on the top and I have now sprinkled them with water (after reading your article). Do you suggest I remove the top that dried off or do you think they will be ok? Also I note from the pictures of your bags that they are clear plastic. Mine came in bags which were white on the outside, and black on the inside. Do you think they will still produce mushrooms? Thanks, Suzanne. @Suzanne: I’d suggest using a spray bottle to moisten the dirt layer on the top of the bags. 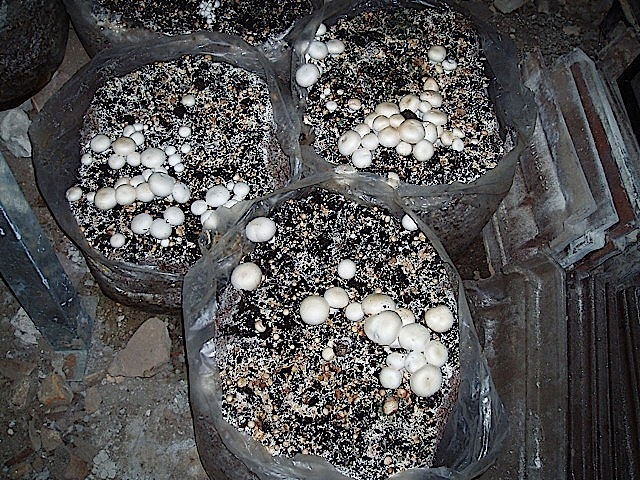 Don’t remove the top layer – that’s what’s required for the fruiting body (mushrooms) to grow. I don’t think the clear vs solid plastic will make any difference. Good luck, and let me know how they go! Thanks Darren, I am using the misting attachment on the hose morning and night, so about the same as a spray bottle I guess. How long does it take to produce mushrooms? Does this depend on the time of the year? I’ll keep in touch and let you know what happens! Cheers, Suzanne. @Suzanne: Just be careful not to spray too much water. I liked the spray bottle, since it only moistened the surface and didn’t soak everything. Mine were already fruiting when I bought them, and they just continued to fruit. Fruiting depends on things like humidity and temperature, rather than time of year. Darren, Thanks for your help – I’ll try the spray bottle and let you know how I go. Cheers, Suzanne. Thanks for the great article. We just found a farm that gives away its compost, sadly they tip it all into a pile :-(. Am going to let a couple of bags sit for a while anyways, cant do any harm. Looking around the place, it looks like they harvest the mycelium, grind it up and reuse it, so will look for any they missed and reuse it next time. 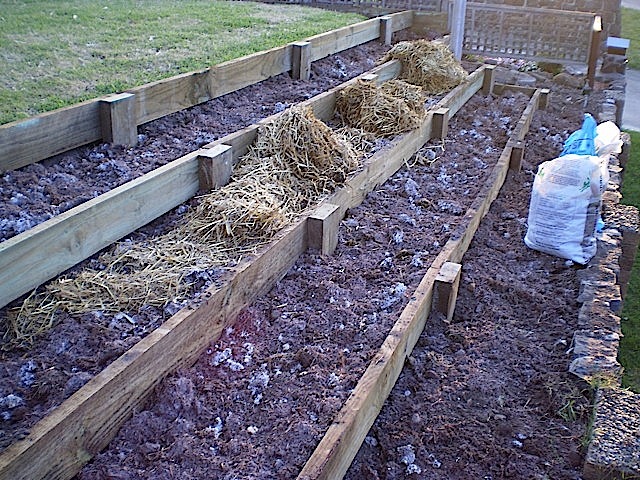 @Queen of String: You could bag up some of the compost, moisten it thoroughly (but don’t drown it! ), and then top off the bag with a layer of dirt. The mycelium will still be in the compost, and with luck it might come back to life and spread through the bag again. Once it’s fully colonised, it should push mushrooms up through the soil layer. That’s the theory, anyway :-). Thanks for the quick response Darren. Will give that a go. This place seems to give away their compost all the time, and they appear to grow exotic mushrooms, so would be extra good to get some free! The stuff we got this time was so warm it was steaming, so not too hopeful, but as the weather dries up, we will be able to choose what we take and that might work better. Fingers crossed :-). No worries. The only thing is, if the compost is truly “spent” and has no nutrients left, then the mycelium will not re-colonise. Still, it’s worth a shot. @Suzanne: That’s fantastic! You can’t buy them that cheap (or fresh!) at the supermarket :-). I pull them up, but I’m really not sure if cutting would be better. Hi, England here; just taken delivery of 8 bags of ‘spent’, just like the ones in your pic, now in shed, dampened and in the really quite dark. Thanks for all the tips on here, looking forward to seeing what is produced. @Fran: Excellent! Another home-grown mushie convert, I’m sure :-). 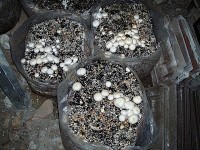 Dear Darren, I am a large commercial grower of button mushrooms in India and appreciate the way you use the spent mushroom substrate after the economic viability drops.This is for three major flushes usually a period of 20 to 23 days (per bag yield for 2.5 kgs in 12 kg compost bags).Mushrooms keep on growing for over a peiod of upto 45 to 50 days after this period but the yeild is commercially unviable for is as it may only give 25% yield in double the span. Darren i wish to share what you do later of this spent mushroom substrate.The best usage as per your experience. @Sanjay: Thanks for the info – that confirms what I thought was happening with the not-quite-spent mushroom compost. 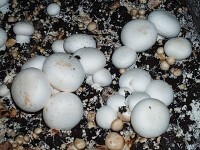 After growing some more mushrooms, I use the spent substrate in my garden. 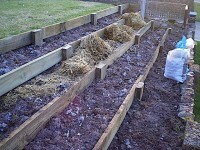 I dig it into the soil if I’m preparing a garden bed, or add it to my compost heap to let it break down more. I want as much organic matter as I can possibly get my hands on for the garden – I just can’t get enough! Your articles are very interesting ! I come from Germany and live in Adelaide. I always loved mushrooms and plan to get some mushroom compost now, since all the mushroom growing kits I tried did not work well at all. Can I grow them in the house in a spare room or will it smell too much ? I am worried about the summer heat coming soon. And is any time of the year good to try the mushroom compost ? @Bianca: I wouldn’t keep them inside – they smell a little musty, and need damp conditions. Under the house or in a shed/garage would be best. I expect summer is probably the worst month for growing mushrooms, as the warmth will encourage the growth of other organisms in the bags. Thank you for your advice ! I do have no shed or space under the house. All the garden gets lots of sunshine. But I do have an old fridge with around 10 – 15 degrees. Do you think it could work to put the mushroom growing bag(s) in there ? @Bianca: The old fridge might work – I’d just be a little concerned about the lack of airflow. It’s probably worth trying one bag and seeing how it goes! I recently brought a box of Mushroom spores supposed in with the compost in the box,I have had it about a month and nothing is happening.Could you please tell me how to get results. Regards Deb. @Deb: I’ve never had any success with store-bought mushroom boxes, and I don’t know anyone who has. I’d take it back to the shop, tell them you followed the instructions exactly and nothing happened, and insist on a refund. @Andryan: Sorry, I don’t live in that area so don’t personally know of local suppliers. Try looking up “mushroom farms” in the local Yellow Pages. I’m sure if you ring around you’ll find someone. I use an old fridge that does not work to combat the heat during the day then open it during the night. Very successful and retains more moisture. Have collected spores and hopping to make up my own trays to cultivate. I try to follow the manufacturer’s instructions at home mushroom kits. Can you help me? @saeed: I can’t really help you if you can’t read the article above. I specifically said I’ve never met anyone who had any success with a home mushroom kit. If you followed the instructions and it didn’t work, you’re entitled to return it for a refund. Hi Darren, I bought some mushroom compost last week for my new vegie beds but have some over & would like to grow mushrooms! The compost was in a huge pile & had a scoop emptied into my trailer! I noticed that you previously said it should be in its original bags to be viable, but I have a packet of Mr Fothergills Marvellous Mushroom dry spawn grains & wonder if I should use my own compost or this spent stuff to seed with it!? @Dave: You could probably leave the mushroom compost in a big pile and get some more mushrooms from it. I’m not sure about the dry spawn, as I haven’t used that before. I don’t think it would work with the spent compost – if there are any fungi-feeding nutrients left in it, the mycelium already established in it would outcompete the introduced spawn. I’d start it with new compost, but definitely read the Mr Fothergill’s instructions. You may need to use particular ingredients in your compost, and you likely need to sterilise it first to eliminate competing strains of fungi. Thanks Darren, I will certainly do that!